I dont mind Smiths and do use this place on a regular basis but I do have to agree with the comments about the staff and smell! The ground floor smells of stale beer/spilt alcoholic drinks which have not been cleaned up properley and the bar staff are some of the rudest I have ever come across, even in London! It's a real hit and miss place - sometimes its a great atmopshere, other times its shocking! My family and I were so excited to get a table on the 2nd floor at Smiths (the Wine Floor) and we have to admit that we had the best red shiraz there ever. We have since been back in touch with Smiths and got the info on the wine, and they have offered to get a case at cost for us. However, the food and service that evening (Sunday after Notting Hill carnival) was really attrocious. Trying to get a smile from the waitress was like pulling teeth, although she was australian and I thought they were supposed to be friendly. Our starters were inedible; so much lemon on the potted shrimp that we had to leave it. The main courses were very salty. It was perhaps one of the worst meals that we have had ever, and we eat out alot. When the bill came, it had the 12.5% service charge already on it, which we paid without a fuss (as the staff had glared at us while we paid) but we didn't leave a cash tip which we normally would. Don't go - there are much better gastro pub places around Faringdon for at lot less money (and litterally about 10 mins walk away). The hostess and the wine staff are ace and should be snapped up. Dined on the ground floor on Sunday - NEVER AGAIN - rude staff, tiny portions, rubbery eggs, soggy chips and supposedly thick cut ham was actually thinly sliced bacon. Not what you'd expect from such an expensive restaurant after an hours wait. Possibly the worst bar I've ever been to. The customers are arrogant and aggressive whilst the staff are paranoid and confrontational. There are a few interesting beers but they're very well hidden and the staff have no interest in finding them let alone serving them correctly. The decor is cheap and worn. The whole establishment has a stagnant unpleasant smell. 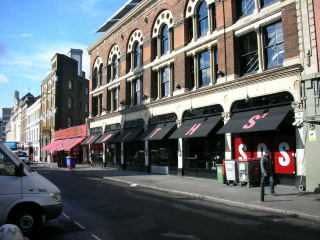 contrary to the previous reviewer, Smiths was not the first place I had a drink in London. But otherwise he has hit the nail on the head - a really awful place in so many ways. They do have a few interesting (but overpriced!) beers, and the bar does serve as a minimally passable holding pen if you're having dinner upstairs.